Happy Monday Everyone! I hope you all had a great Super Bowl Weekend! 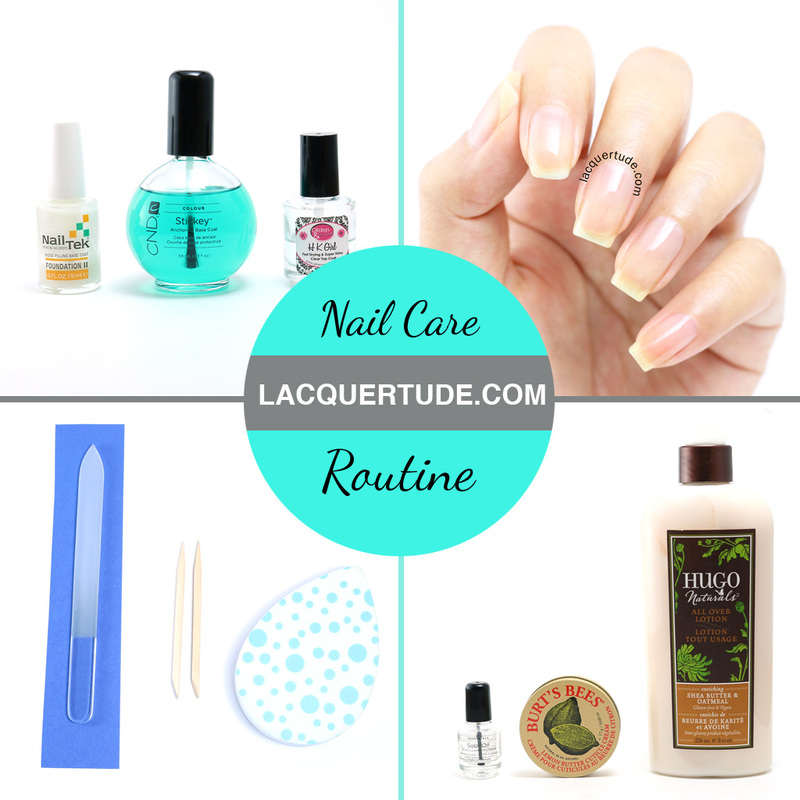 Today I have a much requested post for you — Lacquertude nail care routine! Are my nails real? How do I grow my nails so long? And what do I do to keep them strong and healthy? These are some of my most asked questions on Instagram and emails through my blog. So, I have included the most essential steps and products I use on a daily basis. The first order of things is to show you my bare nails! *Insert nervous face*. There’s nothing on them except a thin layer of CND Stickey Base Coat. As you can see, my nails are definitely real since you can tell they’re slightly stained from enduring so much nail art and swatches. 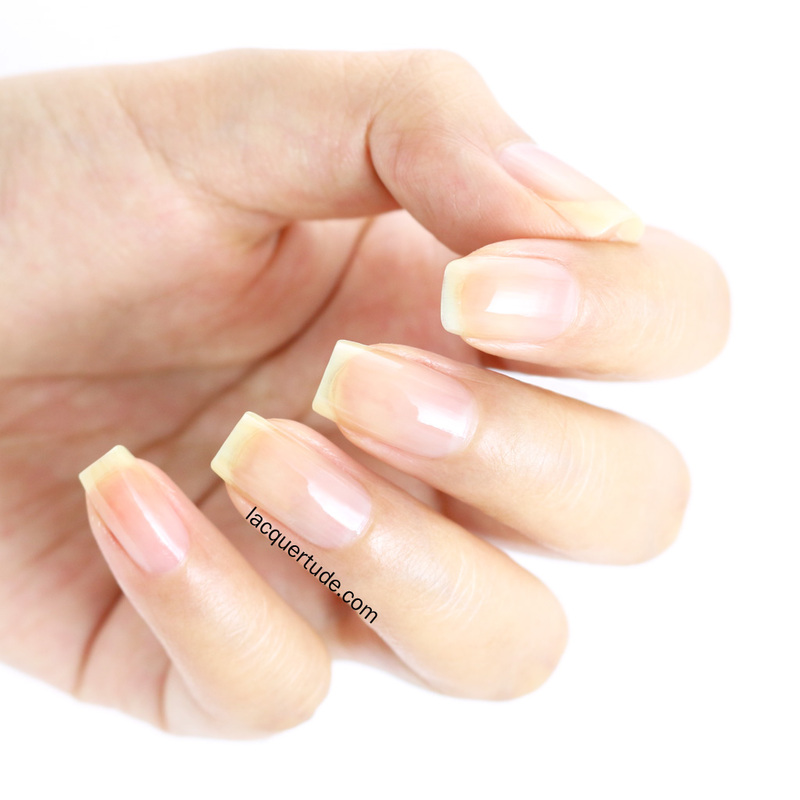 My nail bed is naturally long and very curved, so I normally only keep the free-edge to between 1-2 millimeters in length. I have trouble doing daily tasks and preventing them from breaking if I let them grow much longer than that. I have a pretty straightforward routine for cleaning and shaping my nails. I always wash my hands, then allow the nails a good amount of time to dry completely before filing them because water tends to temporarily weaken the nails. If you’ve noticed, after you shower, do your dishes, or wash your hands, your nails seem softer and more bendable than when they are dry. To file them, I much prefer fine grade glass files. I’ve used emery boards and rougher glass files, but I found them not as easy to control and they always felt too rough for me. My nails grow pretty quickly, so with a fine glass file which works slower, I prefer to file them a couple times a week. The one pictured above is from Quo by Orly that I got on sale at a local drug store. You can probably tell I’ve gotten good use out of it over the last 8 months or so. If you can’t easily find the Quo by Orly brand, then the Sephora Crystal Nail Files are great too! I lost mine, but once my Quo file gets too old, I’ll be getting the Sephora file for myself. 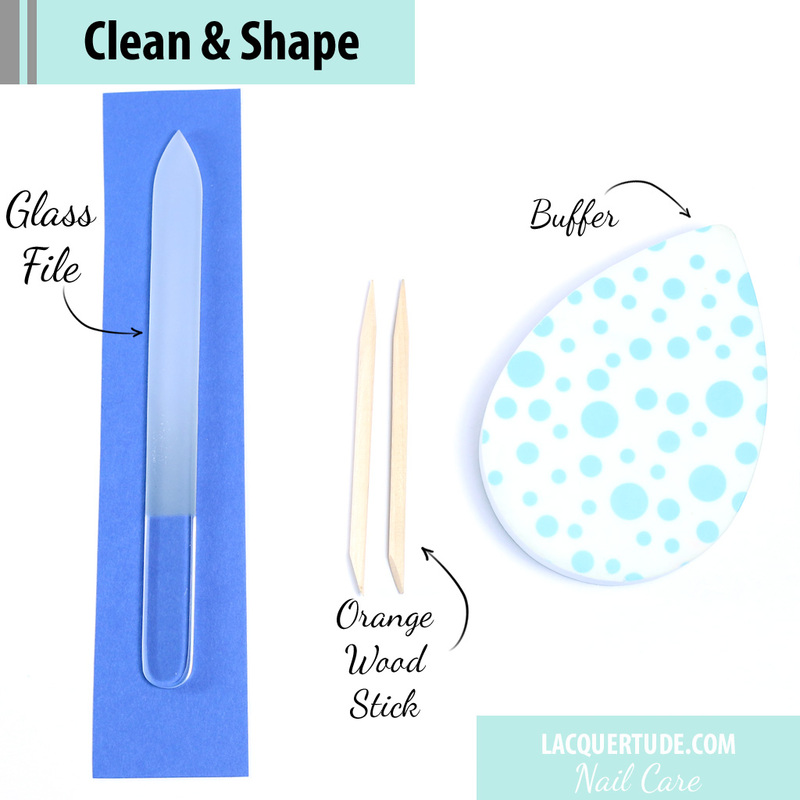 I use the orange wood sticks pictured above to clean under my nails. The Revlon Crazy Shine Nail Buffer has 2 sides: the green side (on the back of the dotted side, not pictured above since it’s pretty ugly from my previous uses) smooths the nail surface and the dotted side buffs the nails into a natural shine. I don’t buff my nails very often because it weakens my nails. But, occasionally I do buff them, especially when I’m using polishes that tend to show ridges (like some holographic and matte polishes). 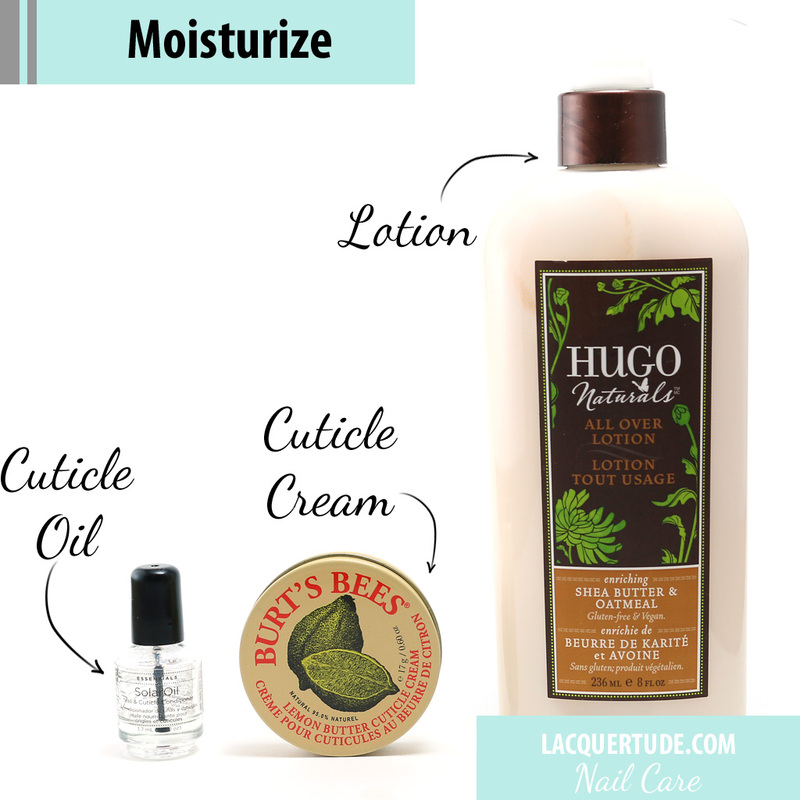 I cannot emphasize enough just how important it is to moisturize your cuticles and hands. This goes for normal polish lovers, but even more so for us bloggers and swatchers, who have to take photos of our hands and nails on a daily basis. It’s so much more pleasant for everyone when our nails, cuticles, and hands are properly moisturized, not show dry spots and flaky cuticles. I am always looking for different moisturizing products. Currently, Burt’s Bees Lemon Butter Cuticle Cream is my go-to cuticle cream. You’ll see on the website that they’ve got a new packaging with a silver outline on the tin. This goes to show you how long one little tin lasts! I use it on average 2 times a day, some days I use them more or less depending on how much I washed my hands and how dry the weather is. I use CND Solar Oil every night. Because it’s quite oily, I don’t use it during the day. But, I love the subtle almond smell and find it really hydrating to wear at night. On the CND website, you can see all the different sizes available. Not all retailers carry every size. For me, I prefer the smallest size because a little oil goes a long way, and if you don’t finish a bottle within a year, it starts to not smell so good (kind of like what expired cooking oil smells like). I have naturally dry hands, which also impact my cuticles and nails. So, I’m always on the look out for great hand moisturizers. I prefer products that use more natural ingredients, don’t contain too much perfume, and are hydrating but not greasy. My mom introduced me to my current favorite: Hugo Naturals All Over Lotion with Enriching Shea Butter and Oatmeal. I apply it repeatedly throughout the day, every time after I wash my hands, before and after I paint my nails, and before I go to bed. There are 6 other fragrance to choose from. It’s vegan and made of 100% natural ingredients, and is soy free, gluten free, and cruelty free. It does not contain any parabens, phenoxyethanol, sulfates, PEGs, propylene glycol, petroleum products, artificial colors, synthetic fragrances, or any other common harmful ingredients found in cosmetics products. In fact, the ingredients list shows that it contains mostly herb and plant extracts. You should definitely look into this if you’d like to try natural moisturizers. And another bonus, it’s only $9.99 for an 8oz. bottle plus shipping if you order from the website. In case you’re interested, they also have bath, hair, aromatherapy, and baby products. 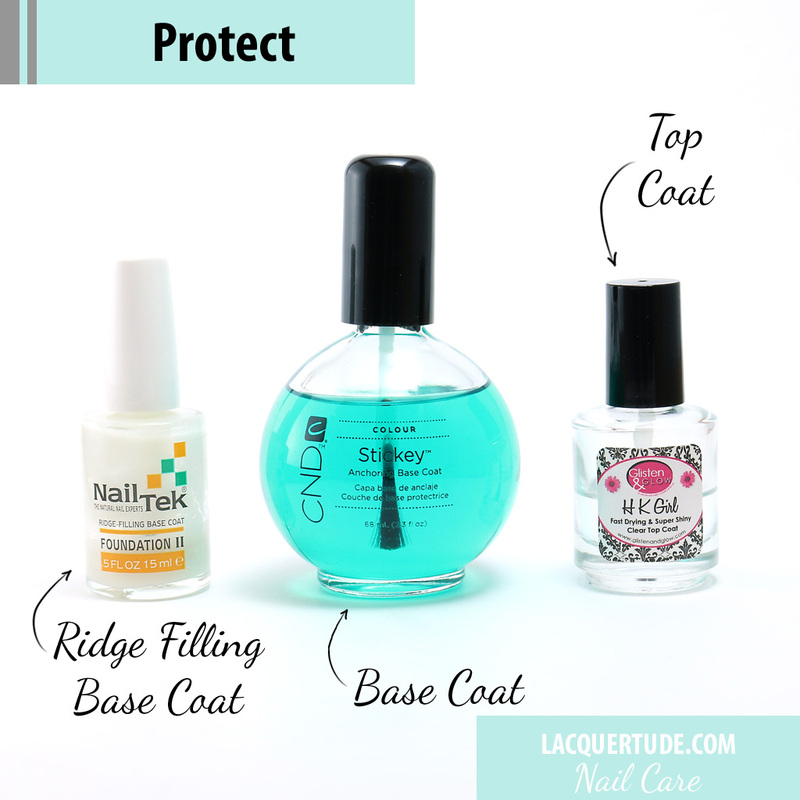 To prevent nails from breaking, I always make sure I use a good base and top coat. I’ve got at least around 10 base coats and top coats in my stash and I’m still always looking for better ones out there. Nail Tek Foundation II is a great ridge-filler and nail strengthener. I protects the nail, gives a slightly milky finish which is great to go under sheer polishes, and dries super fast. It does contain formaldehyde, so if you’re weary or against it, it might not be the best choice. However, I use it in moderation and only 2 weeks at a time, once I feel my nails are strong enough, I stop using it and only start again when I feel my nails are weakening. HK Girl Glisten & Glow is currently my favorite top coat. It’s fast drying, provides perfect shine (the “glisten & glow” part is truly as advertised), and the best part is it doesn’t streak my nail art! Whew, high five for those of you who made it to the bottom of the post and glowing stars for those who are already doing a similar or even more extensive care routine. If you are not currently doing any nail care routine and wish to improve your hand and nail conditions, I strongly encourage you to try some of the suggested products and tips! Just start with one thing in the beginning: apply cuticle cream & lotion (ok, I cheated, that’s technically 2, but they’re both super important!) and if you stay consistent, I promise you’ll see results in a week. And soon, your nails will look just as nice or even nicer than mine! Got any questions, comments, or suggestions of your favorite hand and nail care products? Please let me and other readers know in the comment section down below. lol, I am swooning over your long beautiful nailbeds! I’ve learned to accept my medium ones without too much groaning. Other than a couple of nails with pronounced ridges, they are in good health. I am aware they could be shorter and/or wide. Or, even worse, malformed. A friend has a thumbnail that is curling into her skin along the sidewall and is constantly infected. Apparently, the only solution is to remove the nail and hope it grows in better. So, yes, after seeing/hearing about some other nails, I appreciate and take care of my nails/cuticles.But that doesn’t stop me from admiring yours! Your nails are gorgeous Kate! I absolutely LOVE HK Girl topcoat. It’s the fastest drying and most reliable topcoat I have found. The Burt’s Bees cuticle balm is amazing too! The smell is great! I love this post!